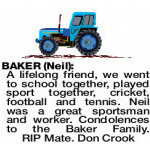 In loving memory of Neil. Beloved husband of Bobbie (dec). Loving father and father-in-law of Sue and Rolf, Kim and Karen, Paul and Alison. 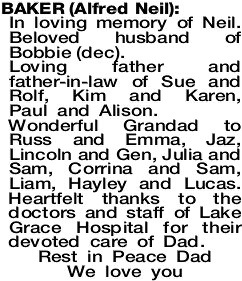 Wonderful Grandad to Russ and Emma, Jaz, Lincoln and Gen, Julia and Sam, Corrina and Sam, Liam, Hayley and Lucas. Heartfelt thanks to the doctors and staff of Lake Grace Hospital for their devoted care of Dad. 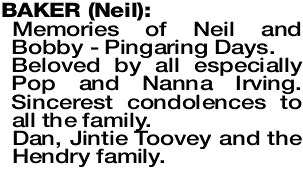 The Funeral Service for the Late Mr Neil Baker of Pingaring will be celebrated in the Maria Regina Roman Catholic Church, Bennett St, Lake Grace on WEDNESDAY morning (10.4.2019) commencing at 11.00am. 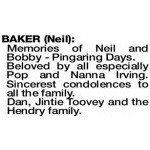 Memories of Neil and Bobby - Pingaring Days. Beloved by all especially Pop and Nanna Irving. Sincerest condolences to all the family. Dan, Jintie Toovey and the Hendry family. Deepest condolences to Sue, Kim, Paul and families on the sad passing of your much loved father, father-in-law and grandfather. Remembering the good times always. Resting in God's care now. Much love and respect from Bev and Peter Wojtowicz. 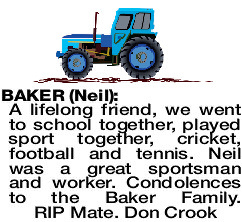 BAKER NEIL Our deepest sympathy to Sue, Kim and Paul and families on the passing of Neil, a Foundation and Life Member of our Pingaring Golf Club. Farewell Neil.